One of the sweetest parts of a marriage celebration that we have observed in our time photographing weddings and engagements in and around Washington, DC, is the portion of a traditional Indian wedding that follows the actual wedding ceremony. In most (but certainly not all) forms of celebrating an Indian wedding, after a bride and groom exchange their vows (typically by tying a gold thread around the bride’s torso), the bride’s and groom’s families and the other assembled wedding guests approach the stage one-by-one and offer their congratulations to the newlyweds. This sort of thing happens in weddings held in accordance with nearly every cultural tradition, of course. Sometimes its on a semi-organized basis, such as when a bride and groom pass through a receiving line after exiting the church in which they got married. In other marriage celebrations, wedding guests pull the bride and groom aside during the wedding reception to give a few words of congratulations and to wish them well in their new life together. What makes the Indian tradition so special, though, is that it is a formal ritual that is an integral part of the whole wedding celebration. As wedding and engagement photographers, we particularly like this aspect of it, because it gives us the chance to get the bride and groom on film interacting with the people who are most important to them and who have in some way or another played a key role in their journey to the altar. When congratulating the newlyweds happens at random times during the wedding reception, it can be challenging for a wedding photographer to capture images of those special moments. When it is done the way it is in an Indian wedding, we are able to take so many pictures of the bride and groom expressing the sort of beautiful emotions that make for epic wedding and engagement photography. We created this unforgettable photograph of a bride doing just that at an Indian wedding celebration in Silver Spring, Maryland, a prominent suburb of Washington, DC. After she and her groom tied the knot (literally, as is the case in most traditional Indian ceremonies!) at the Silver Spring Civic Building, a long line of friends and relatives made their way up to the stage to greet and congratulate the newly married couple. The length of the line was a testament to what a huge group of people thought highly enough of the bride and groom to join them on their big day. The image featured here was taken when the bride stood up to give her best friend the biggest hug she could muster. 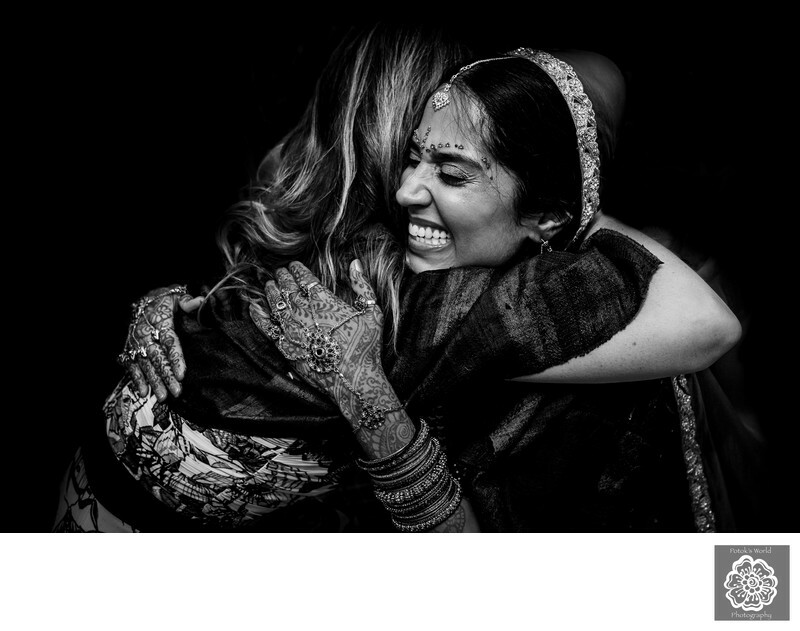 What we particularly love about the photo is the look of unrestrained joy on the bride’s face as she receives her friend’s congratulations for having gotten married. The friend is so obviously happy for her, and she is so happy to have such a good friend in her life. These are the emotions and the moments that make wedding days so special, and that is why our biggest goal as wedding and engagement photographers is capturing them on film and preserving them forever for the brides and grooms who hire us.